Foxpass is excited to officially announce some new features we've rolled out over the past few weeks as well as some upcoming features we have in Beta. Microsoft Office 365 support is here! If your organization uses Office 365, just sign up or sign in on Foxpass.com. You can also set up Foxpass to sync with your Azure AD from the 'Config' page. If you missed it earlier this month, we released a VPN AMI in the AWS Marketplace. Read the announcement here and read about why you need one here. There's a known bug with OpenVPN's LDAP extension that causes crashes when it encounters connection problems and timeouts. We've created an updated package for Ubuntu 14.04 that fixes it. You can download the package from launchpad here. 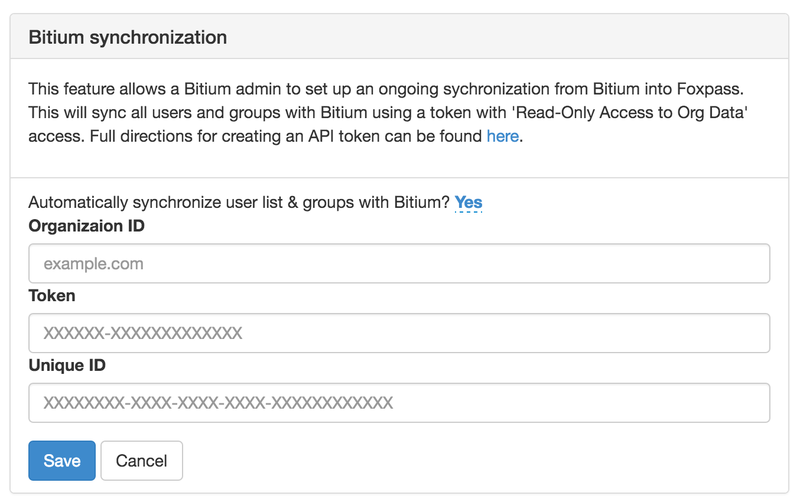 We've added the ability to set up an ongoing synchronization from Bitium into Foxpass. If you turn on Bitium sync, all your users and groups will be automatically synced with Bitium. Go to the 'Directory Sync' page to get started. You can now exempt specific users from using delegated authentication. This is especially useful for remote or machine accounts that aren't stored in your directory. Additionally, you can check the logs to see if there’s an error delegated auth error reporting as well. You can now sort your user table by column header. Just click the header to sort or reverse-sort by that column.